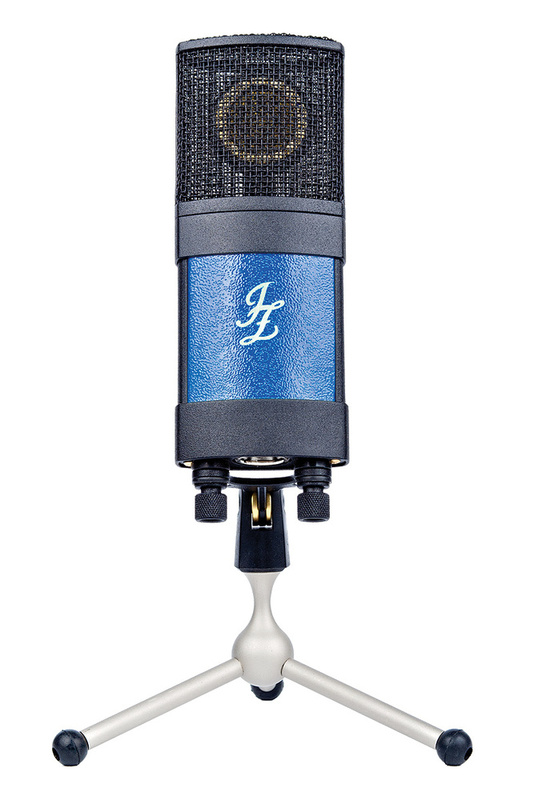 JZ’s microphones are known for combining quality sound with a stylish aesthetic, and this latest model is no exception! Latvian manufacturers JZ Microphones are the work of Juris Zarins, who always manages to come up with something that is distinctive, both visually and sonically. 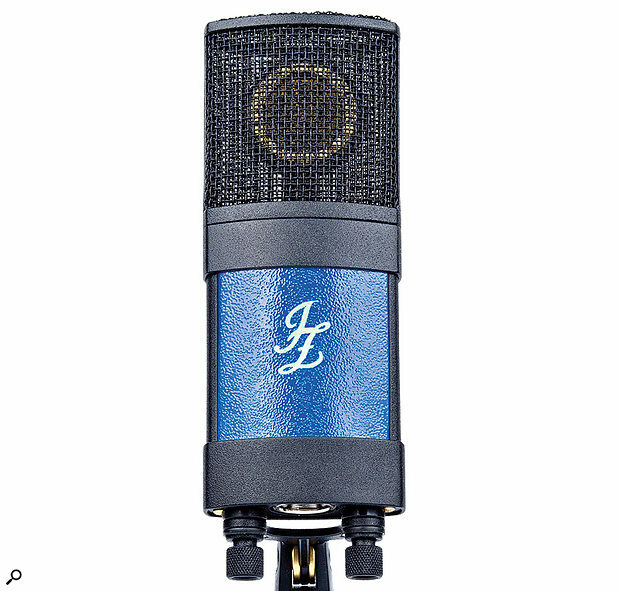 We reviewed their Black Hole mic back in 2008 and their J1 in 2014. The overall shape of the new V16-BB is not dissimilar to that of the J1 — though internally it is quite a different microphone. The mic is shipped in a foam-lined woodgrain box with a hinged lid and magnetic closures. The mics are both built and tested in Latvia. The cardioid pattern V16-BB adopts JZ’s typical thin, wide profile and features blue body panels plus a custom stand adaptor with integral isolation. Designed as a multi-purpose microphone, the V16-BB can take on vocals and a wide range of instruments, including acoustic guitar. The designers say their aim was to create an intimate sound, tight in the lows and mids but with a contoured high end to add an airy presence. This is achieved by a response that rises gently from around 3kHz to peak at around 12kH. The maximum high lift is in the region of 5 to 6 dB. Overall the response covers the expected 20Hz to 20kHz range and the lows don’t start rolling off until below 50Hz. Other than the presence hump, the response is nominally flat other than the tiniest hint of a bump at around 500Hz, though this can’t amount to more than half a dB or so. At the heart of the mic is a hand-made 24mm capsule with a centre-terminated diaphragm. This is supported within a large mesh basket comprising a coarse, strong outer layer and a finer inner layer. All the circuitry, which is transformerless, is built from discrete components with a Class-A FET topography, and though there are no pad or filter switches, the mic can handle SPLs up to 140dB before significant distortion sets in. Standard 48V phantom power is required. Despite its high SPL handling, its self-noise is low at 9dB (A-weighted) and the sensitivity is 20mV/Pa at 1kHz (1Pa = 94dB SPL). The metal standmount screws into the base of the mic using two thumbscrews, which pass through isolating rubber bushes. 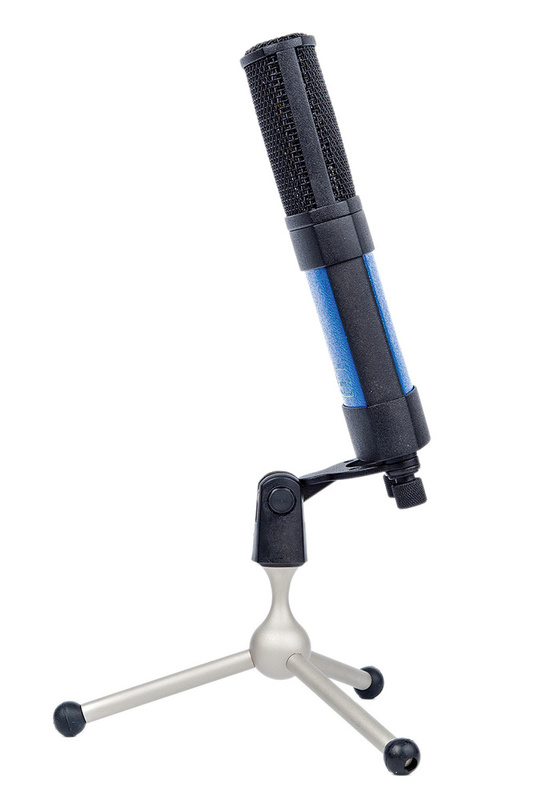 Given the shape of the microphone, most cradle-type suspension mounts would not fit, so having integral isolation makes sense. As a vocal mic, the V16-BB sounds rather different from the other capacitor mics I used for comparison, something I put down to the shape of the upper reaches of the frequency curve. Most of my studio mics have an upper-mid push or presence hump that helps vocals pop out of a mix, but at the same time can detract from the natural sound of the voice to some extent and, depending on the nature of the voice, can sometimes impart a kind of ‘shouty’ quality. The V16-BB has a much smoother, more natural-sounding mid-range than most, and the response shaping higher up the audio spectrum adds a sense of air and transparency rather than the more usual ‘presence’. This also carries over to acoustic guitar where the sound has an honest but lively quality to it. Some singers need that mid-range push to keep them at the front of the mix, but others could definitely benefit from this more refined kind of sound. A little upper-mid EQ boost can put back a sense of presence push if you need it. Even when close-miking, the sound still seems to sit in a space rather than being right in your face. For electric guitar the sound comes over as well balanced when the amp is close-miked but, at a distance, where the proximity effects tails off, it can start to sound rather brighter than the amp actually sounds in the room. This can be tamed pretty well with EQ, though I wouldn’t choose the JZ V16-BB primarily as an electric guitar amp mic. As we’ve come to expect from JZ, this is a very classy-sounding microphone and would make a welcome addition to any microphone locker. I would have liked a low-cut switch but, in most cases, handling that in the preamp, desk or DAW will work fine. If it is for your own vocals, you’ll need to try a few different mics to see what works best for you, but if you’re building up a collection of mics that can cover a wide range of vocal and instrument characters, especially acoustic instruments, the V16-BB has much to commend it. There are many competing large-diaphragm capacitor mics, though most have a more obvious presence peak in the 3 - 6 kHz region. The closest alternatives are likely to be those which seek to emulate more mid-range focused classic designs. Sensibly priced given the quality on offer. Particularly kind to the mid-range. Can only be mounted via the included yoke, as the shape won’t fit conventional shockmounts. The V16-BB is different enough from most of the competition to be worth a closer look, especially if you need a smooth and natural but intrinsically airy sound.